Across the globe, governments and corporations are harassing, threatening, attacking, imprisoning, and killing defenders of environmental and human rights. Meanwhile, the Natural World suffers from escalating threats including extinctions, toxic pollution, deforestation, mining, a rapidly changing climate, and many other onslaughts. Many of these harms rise to the level of “co-violations,” which occur when governments, industries, or both, violate both nature’s rights and human rights with the same action. Recognizing this alarming trend, Earth Law Center (ELC) released its 2015 report “Fighting for Our Shared Future: Protecting Both Human Rights and Nature’s Rights.” This report examined and analyzed 100 such cases of co-violations of human and environmental rights and made recommendations on how to establish a better future for people and planet. Since then, a wave of new, increasingly violent cases of rights co-violations have swept across the globe. This includes acts of violence against two Goldman Environmental Prize winners: Berta Cáceres, who was murdered due to her advocacy with the indigenous Lenca people of Honduras against the Agua Zarca Dam and other “mega-dams” that destroy riparian ecosystems, and Maxima Acuña de Chaupe, who was viciously attacked in Peru for her opposition to gold mining within the an Andean tropical cloud forest. These co-violations indicate serious, systemic governance problems in which the rights of destructive industries outweigh the fundamental rights and well-being of people and the Earth. This report includes only some of the many co-violations occurring across the globe. We want more stories to be heard. Submit your own information below for review. 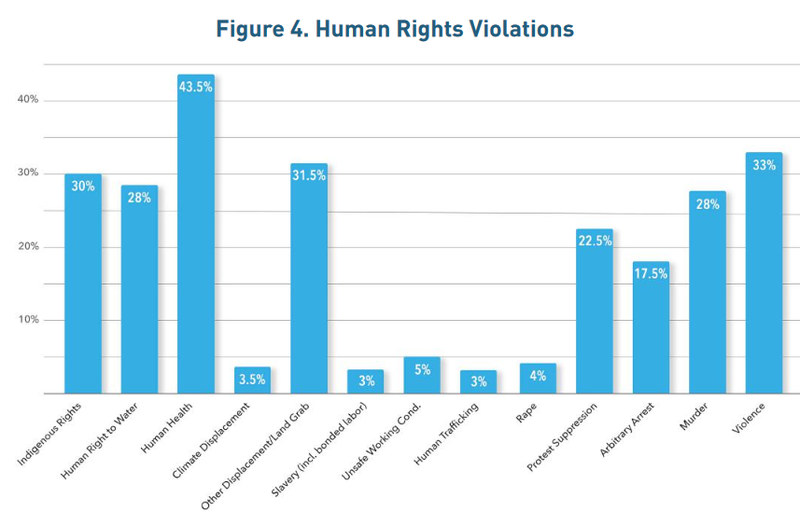 On International Human Rights Day 2016 Earth Law Center released its second annual report detailing these and other co-violations of human rights and Nature’s rights worldwide. The report analyzes another 100 cases – 200 in total – and highlights many chilling trends. For example, 28 percent of human rights violations examined involved at least one murder. And 30 percent of examined cases involved harm to indigenous peoples’ rights, despite their comprising only five percent of the population. The recent rise in injustices toward environmental and human rights defenders was deemed a “truly global crisis” by Michel Forst, U.N. Special Rapporteur. Additionally, almost 60 percent of the cases resulted in biodiversity loss, underscoring an alarming study indicating that the world is now on track to lose two-thirds of Earth’s animal life by 2020. Everyone can help stop the spread of co-violations. You can submit alleged rights violations to the United Nations Special Rapporteurs, who accept and act upon information and send communications to the affected governments. You can submit violations are the Special Rapporteurs web site. Affected communities can also reach out to other organizations working to bring awareness to and address co-violations including the Global Witness, Environmental Justice Organizations, Liabilities and Trade (EJOLT), The Gaia Foundation, and Yes to Life No to Mining Campaign. Environmental Justice Organisations, Liabilities and Trade (EJOLT) Project, “Global Atlas of Environmental Justice,” interactive mapping platform detailing 1000 environmental conflicts globally. Global Witness, "Deadly Environment" (2014), describing the rising threats to environmental and land rights advocates worldwide. Global Witness, “On Dangerous Ground” (June 2016), finding that 2015 was the deadliest year yet for environmental defenders, with over three environmental defenders killed each week on average. Step-by-step guide to protecting your community from mining and other extractive industries. ELC invites the public to submit information on additional co-violations. Please include a summary below, including any relevant links, and we will review the case promptly.